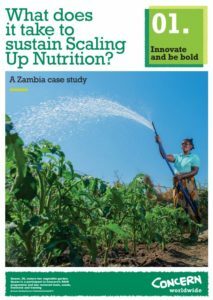 I arrived in Zambia in 2013, at the inception of the SUN Fund support to the government of Zambia’s Most Critical 1000 Days Programme (MCDP) and at a very interesting time for nutrition work. As Concern prepares to close its Zambia operation this year to shift our focus to more fragile contexts and the SUN movement prepares for a second phase of funding, I wanted to reflect on progress since 2013 and consider what is needed to sustain momentum. 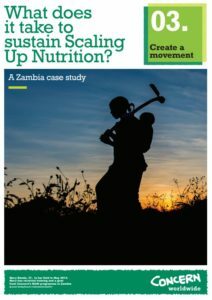 At the end of 2017, Concern, along with CARE and other nutrition stakeholders, developed three case studies to look at different aspects of the SUN Movement in Zambia and work out what it takes to sustain Scaling Up Nutrition. We examined the coordination and alignment across sectors at the level of implementation, the willingness of government and donors to cooperation and collaborate in their interventions and the role of civil society in SUN. 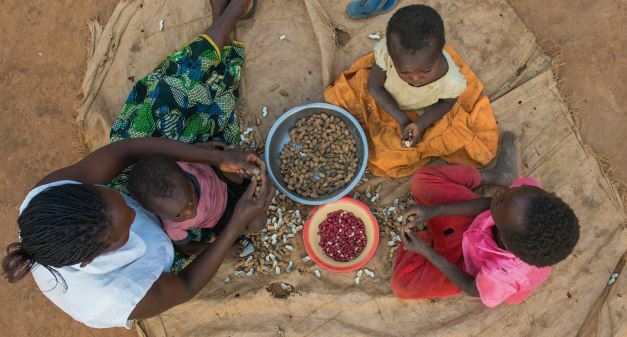 According to the 2015 Demographic Health Survey, stunting here remains at one of the highest levels in the world at 40% and obesity is on the increase, making poor nutrition one of the most stubborn development challenges in Zambia. A willingness to cooperate and coordinate has been one of the most important features of the movement to address this challenge and has been led by the National Food and Nutrition Commission (NFNC). The NFNC has held together all the different strands of the SUN movement and taken a lead in developing the programming side, based on evidence and experience of what works. Behind the NFNC, the SUN Fund is a striking example of international donors (Irish Aid, SIDA, DFID and recently USAID) pooling funds effectively. This ensures that everyone works towards single, tried and tested approach rather than diverging and reducing impact. Around these leadership bodies are arrayed a large number of NGOs, academics and research institutions, UN bodies and stakeholders from both the public and private spheres who are informed and guided by the NFNC’s polices and programme frameworks. 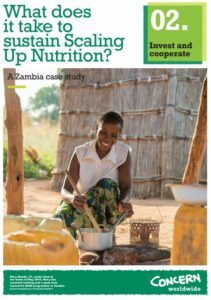 For the most part in Zambia, when we work on nutrition we use the government materials, training courses and job aids, a testament to the quality and relevance of what is available. In 2012, Concern working with the International Food Policy Research Institute (IFPRI) established a platform for mutli-sectoral coordination at the district level. The District Nutrition Coordinating Committee (DNCC) was intended to create a space for line ministries and civil society to convene and align their nutrition interventions through joint planning and a strong common understanding of the multi-sectoral approach to nutrition. The ultimate outcome was to achieve a convergence of actions at the household level where improvements in knowledge, hygiene, health and access to a nutritious diet can stack up and have a meaningful impact on the nutrition of the mother and child. After a long learning journey, the DNCC model, has been adopted more broadly and is recognized as an important means of keeping nutrition on the agenda in local planning and resource allocation. Moving forward, a new round of funding starts this year to support the second phase of the Most Critical Thousand Days Programme. The new MCDP hones down the priority interventions based on a review of cost benefits and the emerging evidence base and provides a framework to take the multi-sectoral approach to greater scale. In addition, there is more focus on women’s empowerment and the adolescent girl and with rates of teenage pregnancy of up to 41 per cent in Zambia, addressing nutrition with young mothers is critical. The SUN Business Network is making great strides in engaging the private sector to increase the availability and affordability of nutritious foods. Work Concern has done on tracking nutrition expenditure shows that funding for nutrition from the Government of Zambia has been pretty static. However, moving forward there is commitment to lobby for increased government financing to address the issue at scale. 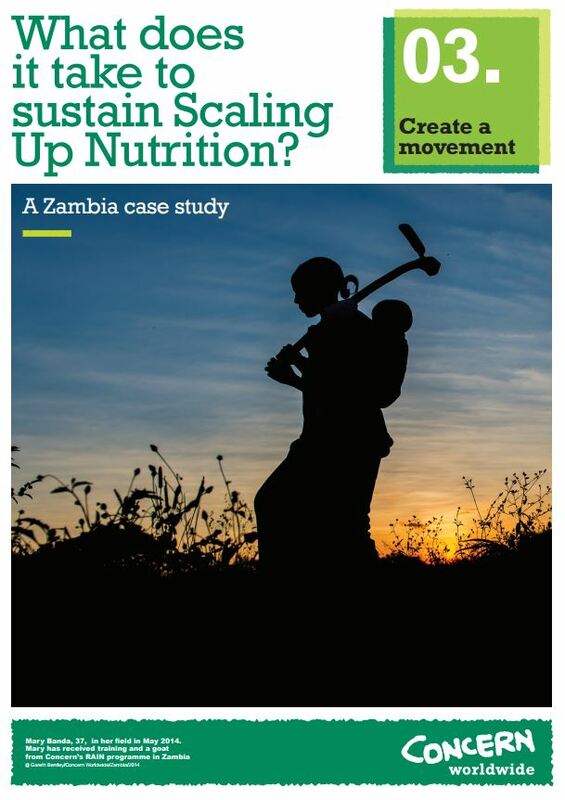 Critical for sustainability is to embed nutrition work in “business as usual” for the Government, ensuring that resources and staff are available for basic service provision and nutrition specific programmes. Alongside government efforts we need more support for the vibrant civil society movement that will create demand for good nutrition and accountability for the public and private services that are needed to provide it. * Danny Harvey is the Country Director for Concern Worldwide in Zambia and has been working on nutrition sensitive and nutrition specific projects including; the Realigning Agriculture to Improve Nutrition (RAIN project), the SUN Fund and the Zambia Female Youth Nutrition and Livelihood Enhancement Project.